So we’re still recovering from last week’s hospital admission for Baby’s seizure. Now hubby has the same fever that sent the Baby into a neurological tailspin. Maybe all the exposure to sick kids has rendered me immune, but I’m the only one who didn’t get whomped by whatever little cousin Hannah brought into the house over the 4th (knock on Formica countertop). Needless to say that I haven’t been cooking much of value, and I’ve been placing too much faith in the daily multivitamin to cover the glaring nutritional gaps. So this was last night’s dinner, not fancy, but it worked. The kids don’t like jarred tomato sauce, with the exception of Target brand! Probably because it is quite mild, kinda thin and has lots of olive oil. I bake my meatballs on parchment, a lot less stove-tending than pan-frying, and you don’t spend the evening smelling like a big meatball. Sauté the onion in a little olive oil over medium heat until soft, about 8 minutes. Add garlic and saute 1 minute, remove from heat. Sprinkle 4 T. soymilk over bread crumbs and let sit, add more if the crumbs still feel crunchy or dry. With a fork, mix ground beef, sautéed veggies, parsley, olive oil, salt, pepper and bread crumbs together. Don’t over mix. Gently shape into meatballs and place on parchment lined baking sheet. Mine were about 1 inch in diameter. On creative days I make hearts, that wasn’t today. Bake for 10-15 minutes, sample one to make sure they are cooked all the way through. 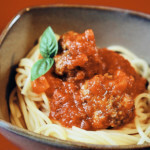 Serve with sauce of your choice, I freeze the extras and just reheat in a pot with the sauce. Previous Post: « Don’t Even Trust the Hospital Food! We eat spaghetti a lot. And I don't go all fancy with meatballs. I know the week we had it 4 times my poor husband finally asked if we could please have something else. It's just so easy and quick usually. Delicious looking meatballs! Somehow I came across this recipe online- love it. So simple and easy and good for my egg allergic son. Thanks!!! Thanks Amy, this is one of those tried and true recipes for me. Sometimes I mix up types of meat, depending on what I have: ground beef, ground pork, italian sausage, ground veal. I tend to bake up a big batch and keep them frozen for an easy meal. I made these tonight. SO GOOD! I'm already looking forward to leftovers for lunch tomorrow. Thanks for sharing! Looking forward to trying these for my daughter’s birthday party – guests with allergies. 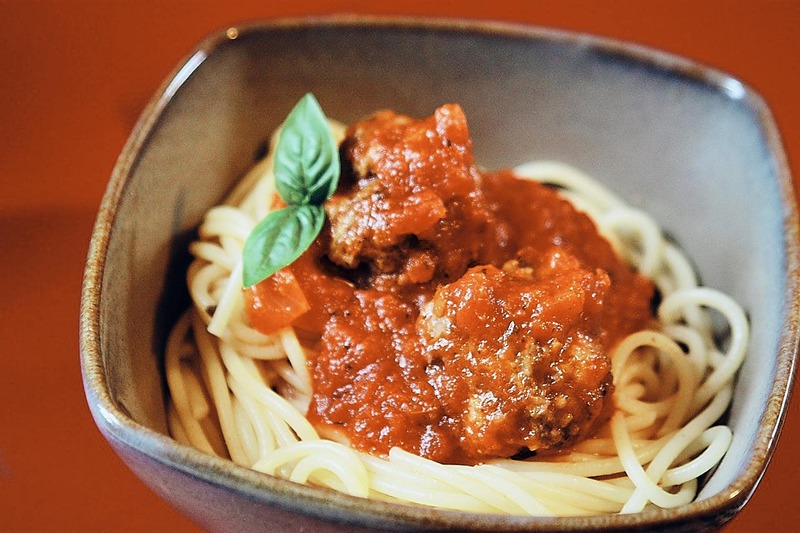 Side note – Cooking Light’s Annual Recipe cookbook, edition 2008 has a Basic Marinara recipe that is THE BEST I have ever had. It uses canned tomatoes and it takes about 30 mins to assemble and start on the stove and an hour to simmer on the stove. It makes 4 normal tomato sauce jars worth and is less expensive. It freezes well too! I think if you take the effort to do this once a month, it will pay off in taste and expense! Thanks Christina! I love parties, enjoy! These are great! My son is allergic to egg and I have been looking for a good egg-less meatball that isn’t dry and I am happy to have found this one. I only had organic artisan grain bread that was fresh so I toasted it and tore it up and I think it added a nice flavor too. My daughter loved helping pull the bread apart! So glad they worked out for you! I think using good bread makes all the difference! I made these meatballs, for a spaghetti dinner, where one of the guests had an egg allergy. I made a few changes. Instead of the bread, I used a half a cup of Italian bread crumbs (which were egg free). I also used a sprinkling of onion powder in place of the onion since we’re not fans of onion in meatballs. I cut the salt down to one teaspoon. The milk and the olive oil worked as a great binder in place of the egg. They were delicious! My Italian husband raved about how good they were, so that’s an endorsement for the recipe. Thank you! Great idea on the onion powder, I’ve done that a few times when I’m really not in the mood to make a mess chopping and a sautéing stuff! Thank you for this wonderful recipe! I have made it a few times–delicious! My only question is what you do with the sauteed onions/garlic. Do you then mix them with the sauce??? That’s what I did, which was delicious, but was just curious. 🙂 Thanks!!! Hi Martha! I actually put them into the meatballs, but I wasn’t clear at all in my directions (I’ve fixed it now)! I sauté them first because they’ll end out too crunchy in the meatballs. But extra onions and garlic in the spaghetti sauce is a great idea too. Target has drastically changed their spaghetti sauce, so now I’ve been making my own. Guess I’ll have to post that recipe! I am going to try these this week…my son has recently gotten erythema multiforme minor which i believe was caused by a milk allergy. He goes to the allergist in a couple weeks but till then we are going dairy and egg free just in case. His rash, fever and joint pain is now gone and i am hoping to keep it this way till his appointment. I will sure be looking at other recipies on this site. Thank you. I have never had to handle a food allergy and recipies like these will be a great help.